The Summer Palace is a beautiful ensemble of lakes, gardens and palaces that offers a good contrast with the crowds and buildings of Beijing. Formerly, during Qing Dynasty, it was an imperial garden. The epicentre of the Summer Palace complex is the Kunming Lake, which was entirely man-made (it seems that the excavated soil was used to build the Longevity Hill). The hill is 60 metres high and has many buildings positioned in sequence. When visiting the Summer Palace, be prepared to walk, since it covers 2.9 square kilometres which have rightfully been included in the UNESCO World Heritage List. We entered the Summer Palace via the northern gate (coming from the underground station of Beigongmen) and stopped in a food stall to buy some lunch. Later, we crossed the bridge over Suzhou Street and saw the Four Great Regions clasping to the hillside. The Four Great Regions is a series of temples inspired by the whites and reds of the Tibetan architecture. We continued climbing up to the Sea of Wisdom, which has a glazed green and yellow façade adorned with lots of little buddhas. Finally, we arrived at the Marble Boat, built in 1755 and restored in 1893 on the orders of Empress Cixi, with money that should have gone towards building ships for the Chinese Navy (real ships, I mean…). We then decided to take a ship ride until the South Lake Island (or Nanhu Island) where we had the best views of the Kunming Lake landscape. Afterwards, we crossed the famous Seventeen-Arch Bridge back to the mainland. At that point we were exhausted (you know, jet lag was still there) so we decided to stop for some drinks in a small bar before continuing our walk towards the feet of the Longevity Hill. We then climbed the south side of the hill towards the breathtaking Tower of Buddhist Incense which is the centrepiece of the Summer Palace complex. Its traditional Chinese architecture contrasts with the Tibetan architecture of the Four Great Regions. Two sides of the same hill but completely different. The views from the top of the hill are just amazing. Indeed, the Summer Palace is like a city within the huge city of Beijing and helps you switch off from Beijing’s crazy pace. I love the Summer Palace! One of my favorite places in Beijing – hope you enjoyed your trip here! Ah that’s a shame your trip didn’t start out well and tickets were sold out, but you certainly saw a lot of amazing things to make up for it! Thanks for linking up with #TheWeeklyPostcard! Fortunately we had planned 4 days in Beijing, so we could succeed 2 days later 😀 Thanks for your comment! Wow! That Summer Palace ranks high on our wish list when we get to China. Looks like, despite the fatigue, you had an awesome trip! 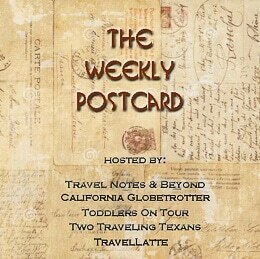 Thanks for sharing with us on #TheWeeklyPostcard! Yes, the first day was hard but then we recovered and had a great time in China 🙂 Thanks for reading!